Right & Middle: Grahame Marks, Secretary of the SMSA, presenting grants to: Nola Barkl of National Council of Women (NSW) ; David Ballhausen CEO, Life Education Australia. Left: Melanie Ryan accepts a painting on behalf of SMSA from a past Julian Ashton Art School Scholarship winner. Double Major Criminology/Criminal Justice and Sociology with First class Honours, PhD student. Life Education Australia is a community-based, independent organisation at the front line of positive and preventative drug and health education with programs reaching school children aged 5-13 years. The SMSA continues to provide discounted rates for venue hire for qualifying not-for-profit and volunteer organisations. In 2014, the discounts to qualifying organisations were in excess of $170,000 inc. GST. This has been a long-standing tradition which benefits both the SMSA and the organisations involved. 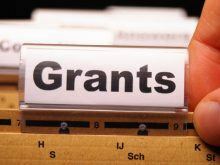 There are also a number of grant applications currently before the board totalling approximately $25,000. All are potential worthy recipients of our support. In view of some large and unplanned expenses incurred by the SMSA during 2014 and other major costs expected in 2015, it was agreed to defer making further grants as had been allowed for in the budget, pending clarification of the amount and timing of those expenses. The recipients of grants in 2014 were all much appreciative of the support received. The Julian Ashton Art School again opened its art exhibition to member at the SMSA. Those receiving grants from the National Council of Women were extremely deserving and highly qualified. It is anticipated that the SMSA will again be able to provide assistance in 2015 to more outstanding applicants. The following were awarded in 2014 by the Board on the recommendation of the Grants Committee.